We liked that the location was off the beaten path which gave the hotel and beach a secluded and private feel. The beds were amazing, the beach was one of the best beaches we visited throughout Greece and Irini was more than just a host she was like family! She treated us with the best care, attention, love, and respect!! We couldn't have asked for anything more. She made our stay so easy and comfortable that we want to visit her again!! We definitely recommend staying here!! Our host was wonderful. She was very friendly, helpful, and made us a great breakfast. It’s a short walk to the beach. Hotel was clean and neat! Service from staff was exceptional! We enjoyed breakfast in our room on our balcony every morning! Food was good and plentiful! They made a real effort to meet our dietary restrictions! They even arranged a car rental and had them pick us up at the port and drive us to our hotel! A car rental was really quite necessary. This hotel is rather far out of the town and although there is bus service around, it would be quite inconvenient. Couldn’t ask for the staff to be more helpful or welcoming! This hotel spoiled me for life! Evi and her husband do an amazing job running Ampelos. They welcomed us like family. The beds were comfortable, showers were hot with great water pressure, A/C worked well, and the housekeeper keeps the place immaculate. The cook makes delicious breakfasts, which include the most delicious Greek yogurt I've ever tasted. Evi rented us a rental car, and took care of all the details. Her husband picked us up at the airport and drove us to the hotel. The beach is just a few steps away! Ampelos provided us with soft, large fluffy bath and beach towels and lovely robes as well. I can't say enough about the hospitality on Naxos. I am so enamored, I'm sure I'll be back. The customer service is above and beyond. I really appreciate Evi going through extra mile for her guests. The triple room was great and clean with a big balcony. Breakfast was excellent and home made. The resort is around 10 km out of the main town of Naxos close to the amazing Plaka beach. If you have a car, this is definitely the place to go! Very tastefully decorated room, bright and airy, exceptionally comfortable beds, very friendly staff, rooms were cleaned very well every day. The beach is just two minutes walk away where there are sun beds and a bar. Having a car/bike is necessary for getting around and enjoying the island. We really enjoyed our stay here. Great place to stay, friendly staff, clean, great looking. Bear in mind you need a car to get to the location. Clean and spacious room. Very close to the beach. Plaka has a variety of shops, restaurants etc as well. The proprietor was very kind and helpful. Lock in a great price for Ampelos Resort Hotel – rated 9.6 by recent guests! 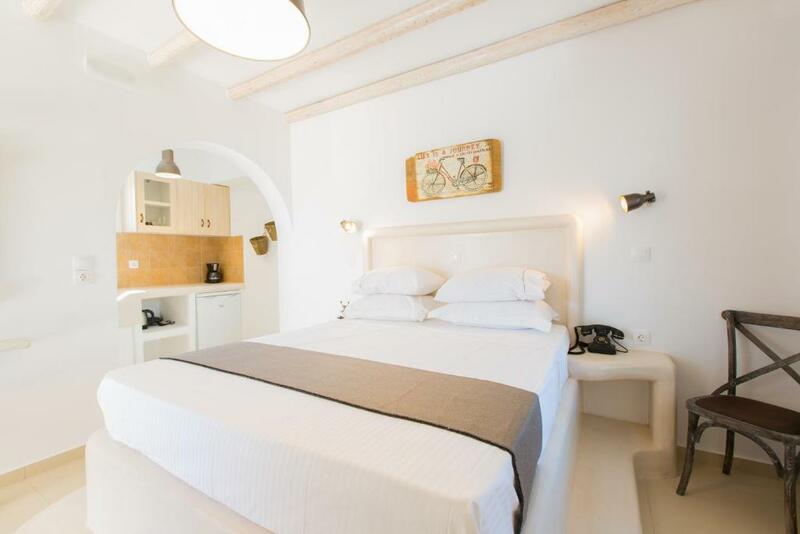 Offering a sun terrace, Ampelos Resort Hotel is located in Plaka, just 250 feet from Plaka Beach. Plaka Camping is 2,300 feet from the property. Free WiFi is provided throughout the property. All units are air conditioned and include a satellite flat-screen TV. Some units have a terrace and/or balcony with sea or garden views. There is also a kitchenette, fitted with a toaster and refrigerator. A stovetop is also featured, as well as a coffee machine and a kettle. Every unit features a private bathroom with bath robes. Free private parking is available at the aparthotel. 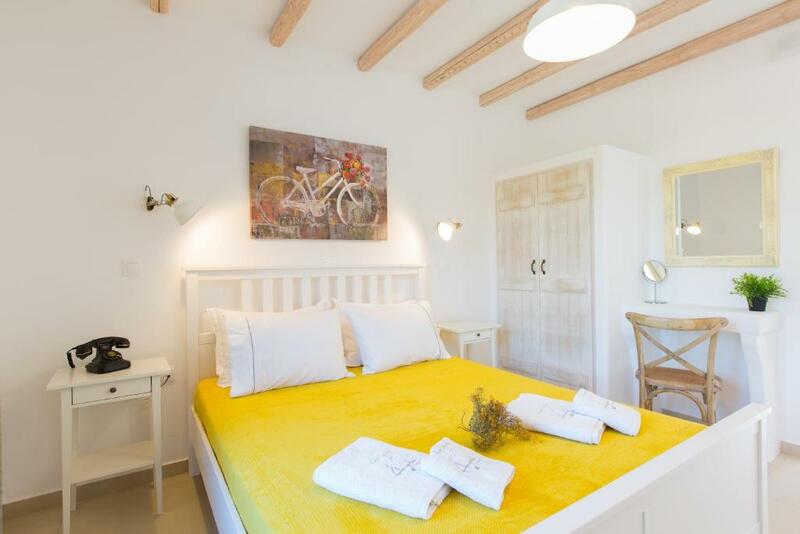 The property has a private beach area and bike hire is available. 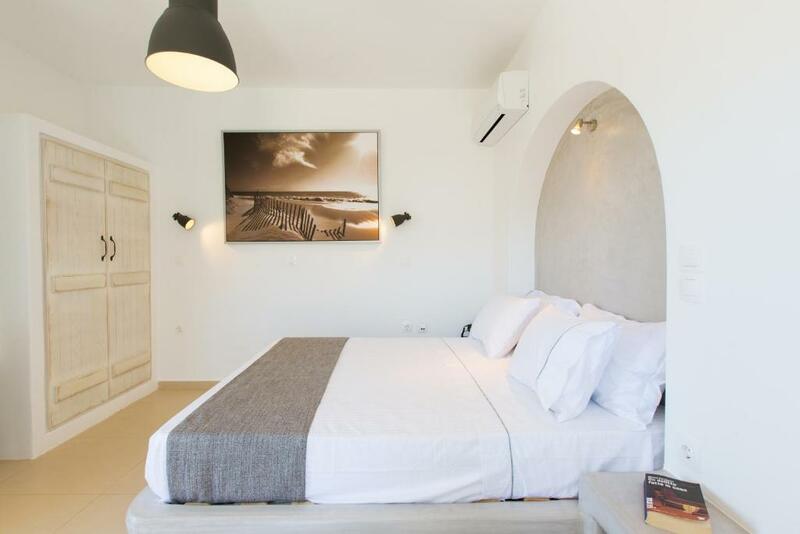 The nearest airport is Naxos Island National Airport, 2.5 mi from Ampelos Resort Hotel and transfer from the airport is available. This is our guests' favorite part of Plaka, according to independent reviews. 뀐 Located in the top-rated area in Plaka, this property has an excellent location score of 9.1! When would you like to stay at Ampelos Resort Hotel? This room type is located on a basement. Ampelos Resort hotel is situated on the beautiful beach of Plaka,just a few steps from the sea, you are going to relax at a quiet area of unique beauty. The water of the sea in front of the hotel is so clear and the landscape is magic. Live this experience and share your moments with us. Ampelos resort hotel is made out of intense feelings, smiles and tears, luxury, faith, dreams, mornings awakenings and sunrises that are visible everywhere. At each point of the hotel we have added our personal feelings, in order you to feel at home... Ampelos Resort hotel has been definitely created with love, lots of love. We like swimming at the beach in front, taking care of our property and meet new people that are coming to spend their holidays at Naxos island. Just a few steps from the beach of Plaka, you are going to relax at a quiet area of unique beauty. Close to us, you can easily get to fabulous Orkos beach or do some wind and kite-surfing at Mikri Vigla beach. From our place, you can easily get to famous villages, such as Sangri and Vivlos. At the backside of the hotel, you can see the rocky background and in front of the hotel the magnificent beach of Plaka. The water in front of the hotel is so clear and the landscape is magic. Live this experience and share your moments with us. 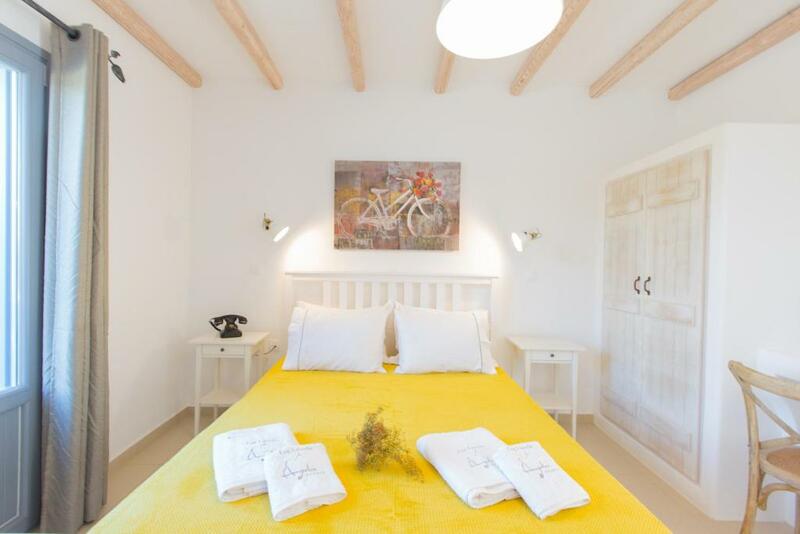 House Rules Ampelos Resort Hotel takes special requests – add in the next step! Ampelos Resort Hotel accepts these cards and reserves the right to temporarily hold an amount prior to arrival. It is a remote location with easy access to beautiful beaches; however, with the remote location there is also some less picturesque construction nearby, and the sea view rooms are not as close to the sea as I expected. The rooms are modern, clean, and very comfortable, and the service is wonderful. Irini was an amazing host, she warmly welcomed us and accommodated all our needs organising transfers to and from the port plus a vehicle for us to rent during our stay. She gave us some great recommendations on locations to visit on the island. We thoroughly enjoyed our time at Ampelos and would definitely go back! Had to walk 50m to the beach! We didn’t realize how far this property is from everything. It’s down a dirt road and you really need a car to be able to get to anything. We felt it was a little overpriced for the size of the room and location. I also really would’ve liked to have at least a thin blanket on the bed instead of just a sheet. There are really no restaurants that are within walking distance either. Location wasn’t really on the Plaka beach. There was a nice beach out in front of the hotel, but not where we thought we were going to be situated. From the hotel room to the service, everything was perfect. Irini was great host! Amazing hospitality and brilliant breakfast. Quiet location and very special. We had some pots and pans in our room, but no cooktop. Not sure why the cooking supplies were there. Ampelos resort was an excellent place to stay in Nacos! 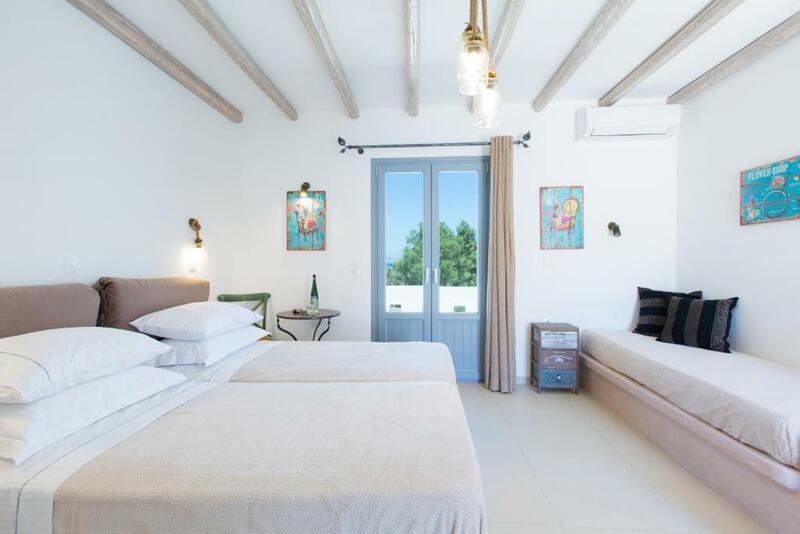 The location was perfect, located at a quieter end of Plaka Beach although still walking distance or a short drive to the more active part of Plaka. There were several beach bars renting sun beds and umbrellas within 1 minute walk of the hotel. There were several restaurants within 10 minute walk and many more within a 30 minute walk down the beach. The hotel itself was beautiful! The room was comfortable and spotless. The balcony was huge and situated so that it was very private, not facing any other rooms. We took the option of breakfast each day delivered to our room which was delicious and great value. Evi was a lovely hostess who was happy to provide recommendations and make our stay memorable. 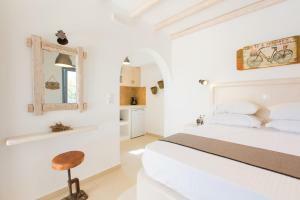 I highly recommend ampelos for your stay in Naxos!